Layer2 and Layer3 switches are the foundation of any network. After all, any network devices (routers, firewalls, computers, servers etc) have to be connected to a switch. Sooner or later, as a network engineer you will be faced with the task of deploying a switch network for a customer or for your own company. Therefore, learning about some basic switch design and configuration principles will prove beneficial for your professional career. One simple and popular switch design scenario will be shown in the following tutorial. This scenario will fit most SMB networks (or even bigger ones) that have a few layer 2 VLANs and consequently a few layer3 network subnets. It is a good design principle to separate network hosts by department or by similar group of users. As far as the design goes I will try to use Cisco’s hierarchical internetworking model (Distribution, Aggregation and Access Layers) with some modifications. For the proposed scenario the distribution and aggregation layer will be combined on the same layer 3 switch to keep the design simple and for better understanding. The diagram above shows one Layer 3 switch used for Aggregation, three Layer 2 switches used for access purposes and one router for Internet connectivity. Company X has several departments grouped on several levels in a building. The departments are Callenter, Sales, Accounting, Support and Management. The only department allowed access to the internet is the Management department. Each of the departments has been allocated a Layer2 VLAN and an IPv4 Class C private address range. All the switches are connected over port-channel links for higher bandwidth and better redundancy. NOTE: Configuration for device management and logging remain the same as Layer3 switch above. We only add the vlans needed on this switch. At this point only the Company Management has access to the internet and nobody else. 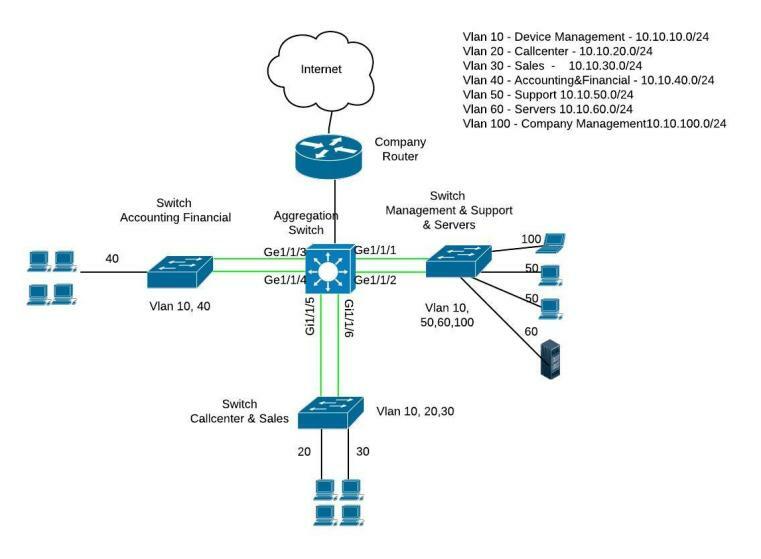 hello very nice teturial sir great job..sir i need some modification in this design like access,distribution,core design and core connected to router and the core and distribution provide reducdency mean 2 links between one swithcromm to anohter not to core and run ospf as routing protocol and some end to end vlan how i can achieve this…plz help regarding..
local vlan and some end to end vlan server connected in the core switch and voip,cctv etc. rstp between switch room making riangle shape. Nice job. But could you add the ip addresses into the diagram next time. I know it will look crowded but will help us to understand better the example. Thank you. but problem is internet not working on both vlans can any one help me on this. Pf sense connect native vlan1 (some systems connect on this default vlan)& no ip assigned on this vlan interface. The IP of Pfsense (192.168.1.1) belongs to vlan 192. So you need to configure the switch interface port connected to Pfsense as “switchport access” port and assign it in vlan192. Also, on Pfsense you need to configure a static route for network 192.168.137.x to be reached via gateway 192.168.137.5 (which is the IP of vlan 137). You need to have a static route on ASA firewall towards VLAN35 subnet. Is there a mixed up between vlan 10 and vlan 100 in the config? I believe there is no mix up between vlan 10 and 100. Can you please let us know where you have spotted an error? however in the later part of the router’s config, the NAT and the route back to the LAN is for vlan100. If I am wrong would you kindly explain why is it so to me? The configuration is correct. Although between Layer3 switch and external router there is Vlan10 only, in Layer3 level the IP subnet of vlan100 (i.e 10.10.100.0) can pass via NAT from switch to router with no problems. The subnet 10.10.100.0 will be translated to 10.10.10.1 (interface of Layer3 switch) and will pass to the router although only vlan 10 is allowed. …shouldn’t this interface be put into vlan 100 or be configured as a trunk? Since it is put into vlan 10 then only traffic from vlan 10 will be able to traverse the link and not vlan 100. In Layer 2 level, yes only vlan 10 will pass. However, vlan10 is associated with layer3 subnet of 10.10.10.0. The subnet associated with vlan100 (i.e 10.10.100.0) will be translated to 10.10.10.1 and the layer3 packets will pass to the router with no problem (via vlan10).